For me, I’d sum it up with, I just can’t live without it! There are things in life that are essential: water, shelter (a.k.a. home) and food. Without these we would cease to survive; 3 days without water; 40 days without food; and not even an hour, in the dead of winter, in North Dakota at -40 without shelter. Thankfully, here on the central coast in California we don’t have to deal with the latter, but life (and the kitchen) are still full of essentials. 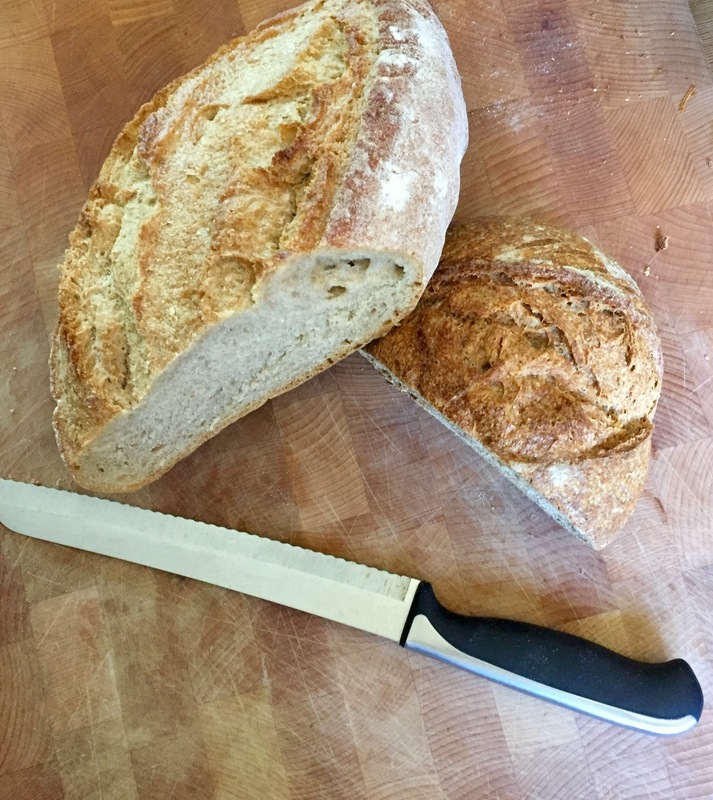 In my line of work, (I am a chef at a local artisan bakery) there are those essential tools that I need in order to do my job and do it well. I have had to use some very primitive means at certain points in my life. I was still able to get the job done and the meal on the table (and in some cases, in my belly) but it wasn’t easy or fun. While those times were an adventure, these tools will make cooking enjoyable and quick. The kitchen should be a fun and exciting environment! The essential tools to keep in your kitchen may vary depending on what part of the world you live in and what you like to cook. So, this list is what I think most kitchens would benefit from having. This handy, silicone cooking mat is by far the greatest tool when it comes to baking cookies and cakes or playing with chocolates and sugar work. It’s easy to clean and care for and it takes the worry out of not spraying your cookie sheet and dealing with the aftermath of that mess. Also, if you wish to minimize waste, these replace parchment paper in most baking situations. They come in a wide variety of sizes and shapes. We have tried a variety of brands but I always go back to the original Silpat. A plethora of attachments allows this beauty to shred veggies, grate cheese and even make certain dough like pasta, biscuit and even streusel. I prefer the classic Cuisinart. A must have for any baker! This baby will mix your favorite muffin, knead your dough for fresh baked bread, whip egg whites for that perfect meringue and pretty much everything in between. There are attachments that you can purchase to enhance what this bad boy can accomplish like the grinder, pasta roller, spiralizer and more! We have a KitchenAid Professional in stainless steel finish. What can’t I say about this guy! My eyes were opened back in culinary school about this being the end-all-be-all gadget for the kitchen. You can chop, pulse, puree, whisk, whip and more all in the palm of your hand. From making soups to dressings and even pesto or an aioli, this is a must have in any kitchen. My Cuisinart comes with several attachments including a mini food processor. That attachment was so handy when our Sprout was starting on solid foods. She could eat anything we ate and it was portable for trips to see family in the mountains. It also makes a great housewarming gift. Let’s look at a more humble tool for a second…the wooden spoon ( yes wooden!) Chefs around the world use this guy in all sorts of shapes and sizes for all kinds of jobs. Nothing works better for making a roux or stirring your veggies. They are inexpensive and indispensable. If you have ever had a well seasoned cast iron you know why it’s on the list. Nothing is better, not only for you, but cooking. With it’s naturally nonstick surface, cooking and cleaning are a breeze. We have several in various sizes. We use our Le Creuset the most. It is pricey but don’t have a heart attack. You’ll be able to pass it on to your kids because it will outlast you! 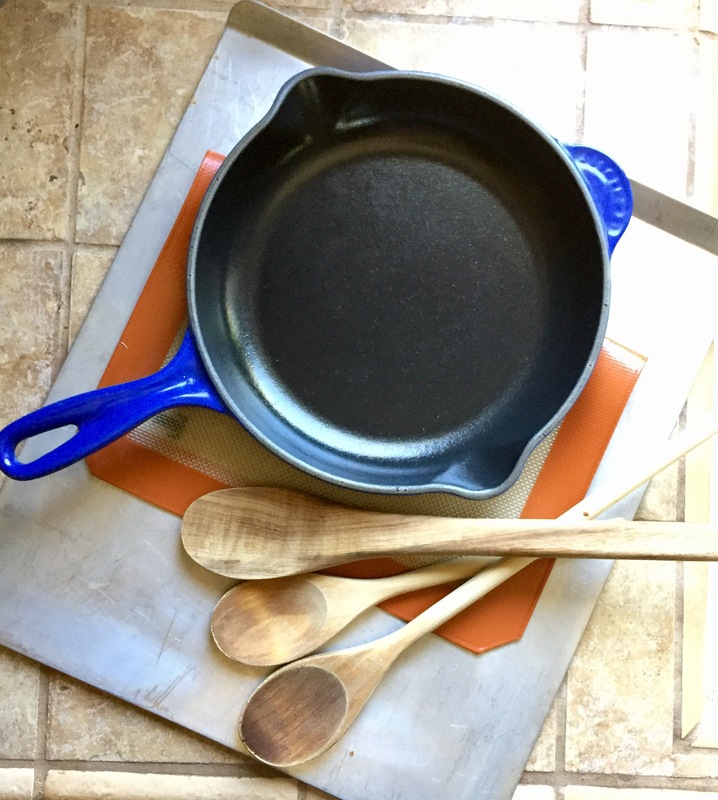 A more affordable option is the Lodge line of pans. They are built well and cook nicely. Always remember to skip the soap when cleaning. A little kosher salt and some boiling water is all you’ll need. Here’s a great video about how to cook and care for your cast iron. In order to make great soups, stocks and broths, or boil pasta you need a good stock pot to hold everything. Look for sturdy design, stainless steel construction and a lid. We have several in our home kitchen. I like our 8 quart stainless steel one. Elizabeth likes her Le Creuset 8 quart. Just like her big brother; the stock pot, a copper bottom sauce pan is great for heating sauces, making smaller amounts of soup, or just boiling some eggs. A 2 qt. is one of the best sizes for versatility. We have several in our arsenal including a Revere, Le Creuset and a basic one. Lastly, the king of kitchen essentials! The best thing to have in your kitchen is a sharp knife. Yes sharp! The safest thing is a sharp knife because it actually cuts what you want it to instead of sliding off and slicing your finger. I like my Global Santoku because it’s all one piece and well balanced. I would encourage you to find one that fits your hand and is the right size and weight for what you’ll be using it for. I’d love to buy a new knife every time Sur La Table’s catalog comes out but we would be broke! (Hey, some guys like cars, I like knives.) I’m telling you, invest in at least one high quality knife and you’ll never cut with anything else again! You might even develop the same obsession with kitchen tools that I have. I suggest investing in a chefs knife, (or Santoku) paring knife, bread knife and a boning knife when you can. If you have those in your knife block you will be set for most tasks in the kitchen. So there you have it! Those are the tools that make cooking a blast and speed up your kitchen projects. All of the tools I described are actually in my kitchen and we use them regularly. What tool would you not be able to live without? Leave a comment below! 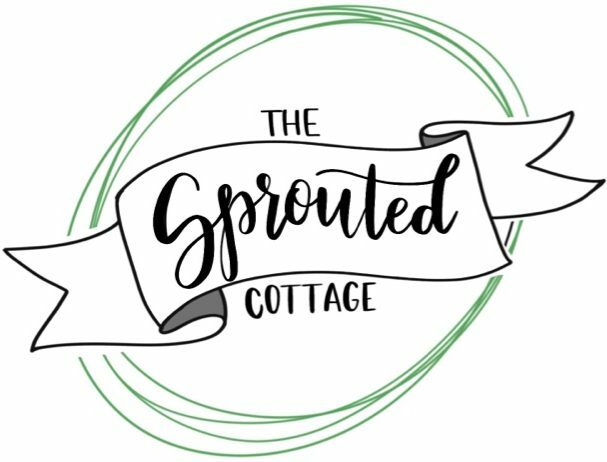 Disclaimer: The Sprouted Cottage is a participant in the Amazon Services LLC Associates Program, an affiliate advertising program designed to provide a means for sites to earn advertising fees by advertising and linking to amazon.com. That being said, we are not sponsored by Sur La Table in any way and are not paid for the links to surlatable.com. We just love to shop there and heads up, if you are in the food industry in any way, they offer a decent industry discount.